I really enjoyed making this soup as I really really like thai food. Chili, Ginger, Lemon Grass and (especially) Fish Sauce are used a lot in thai dishes. Fish sauce is found in most supermarkets now and is also know as Nam Pla. You know you’ve found a good one when it has three ingredients on the label – it really shouldn’t contain anything other than anchovies, salt and water. Warning – use sparingly – it’s super salty and contains over 1,000mg of Sodium per tablespoon. Eesh. Chiles are also a tricky one. Most thai dishes call for a type of chilli called a Bird Chilli – it’s pretty fiery. A good substitute for this one is actually a jalapeño which you can find in most places – and if not try looking in your local thai/asian supermarket. Limes, lemongrass and garlic are also used in this recipe. They’re both used a lot in traditional thai dishes and I would recommend using fresh if you can get it. I couldn’t get fresh lemongrass, only a pot of it minced up with olive oil. I don’t think it tasted as good and it was tricky to know how much to use. 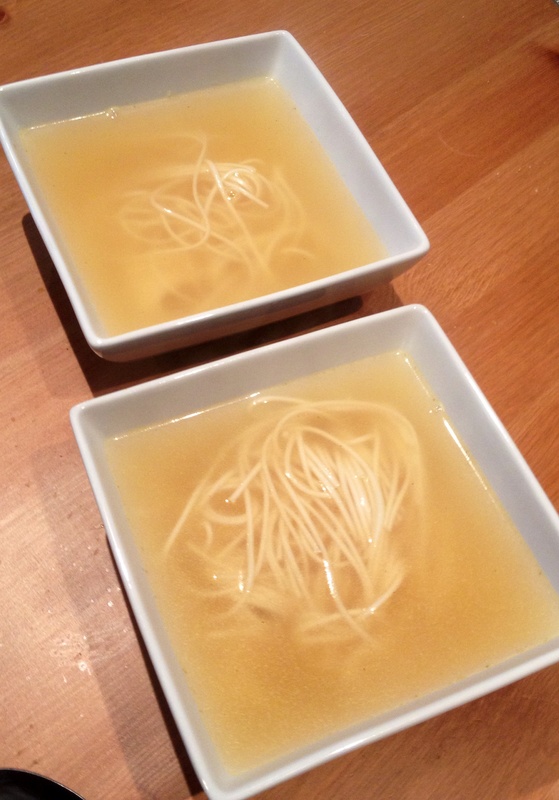 I really enjoyed making this soup, I found it did take me a little while to prepare the ingredients so I wouldn’t recommend making it on a day when you are in a hurry! But this recipe made about 4 portions. I separated it into two pots and it fed both me and Josh twice. I let it cool down in these pots and then stored it in the fridge and to heat it up again I put it on the hob for a few minutes to get it all hot and steamy. We also cooked some beijing noodles (they’re really skinny and found it most asian supermarkets) to add in which made it a proper noodle soup! When preparing the ingredients try and leave them us chunky as you can. All you need to do is put the stock into a pan on a medium heat and add all the other ingredients in! I would recommend leaving the lime until last to spritz on top. After it’s been simmering away for 15-25 minutes you can run the soup through a sieve to catch all the solid ingredients (which you don’t need) so you are left with a scrummy broth. ← Potato Dauphinoise – for Students! This sounds yummy! Did you leave the chilli whole or cut it up before putting in? I hadn’t realised that was all that was in Thai fish sauce! I wonder what happens if you used anchovies and a little extra salt instead? Already have those in the cupboard! Thanks for sharing – this looks full of flavour but with no fat!